We all use flash drives and they are great at holding your data but now how do you use that data on your phone or tablet? Simple this SanDisk connect drive is a normal USB flash drive that also can stream your data wirelessly to your phone and tablet. Put movies on it and your kids can watch them on their iPads in the car. Put a presentation on it and you can show your customers on the go. 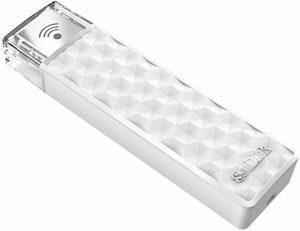 And the SanDisk connect Wireless that we show you is the 200GB one but it also is available in 32, 64, and 128GB. Never forget those important files thanks to the SanDisk Connect Wireless USB Flash Drive.